Because they are not mandatory for adults and, let’s face it, not fashionable — many won’t wear a helmet while cycling… Soon enough, you might not have to! A new airbag designed for cyclists has been developed with the aim of preventing head injuries in accidents. How cool is that?! 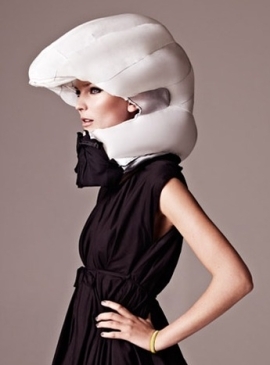 The Hovding helmet sits as a scarf-looking collar around the cyclists’ neck. In the event of an accident, it inflates in an incredible 0.1 seconds, and leaves the skull and neck of a cyclist completely covered in a protective cushion. How does it work?! The collar is fitted with a sensor which detects sudden movement and inflates the bag using a small helium gas cylinder hidden inside (It’s been tested extensively to ensure it inflates safely and in the correct circumstances — it won’t accidentally inflate if the rider suddenly brakes for example). Two Swedish industrial design students came up with the idea. Of course, both fashionable ladies! It’s expected to hit shops in the UK early next year and we are hoping it will then come this way!